The MSD of Warren Township’s wireless lounge. 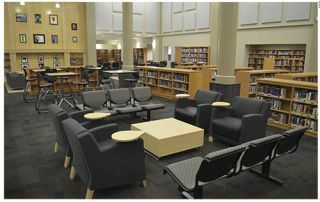 James Aldridge, Chief Technology Officer for MSD of Warren Township in Indianapolis, Indiana, recently managed the transformation of 200,000 square feet of libraries and classrooms into creative learning spaces that encourage creativity and collaboration through open, interactive environments. T&L Managing Editor Christine Weiser talked with Aldridge at the recent School CIO Summit in Denver to find out how his district realized this vision. TL: Tell me a bit about your district. JA: We’re on the east side of Indianapolis and serve a wide range of kids from urban, suburban, and even rural areas, so the socioeconomic build of the student population is very diverse. Seventy percent of our students receive free or reduced-price lunch. TL: How did this all begin? JA: When I got to Warren Township, the first thing that I noticed was that our classrooms looked like they were from the 1970s and I thought, “Why don’t we change them up a bit?” When you’re talking about 1:1 programs and 21st-century skills and project-based learning, the old classroom style does not make sense. That’s where the idea of our Mediaplex came from. Every space I designed in the Mediaplex was based on a 21st-century skill and project-based learning. We have what we call “Collaborative Studios” that look like mini conference rooms, outfitted with 37” monitors, a Mac mini for dual-boot capabilities, dry-erase countertops, and cameras for distance learning. We have a “Creative Thought Gallery” that is a large room with dry erase walls that encourages innovative thinking and problem-solving. We also have computer labs that we call “SI-COM Labs,” which support collaboration between the teacher or presenter and the students. Lastly, we have an interactive theatre called a “Digital Viewing Room,” which has some of the latest and greatest audiovisual equipment. We still have books in what we now call the wireless lounge but we have also invested in lots of e-books so that students can access our library online with their Chromebooks. TL: What sort of costs are we talking about here? JA: The total cost of the Mediaplex was 1.6 million dollars, which included everything: the construction, technology, and furniture. All the money came from the savings that I had generated from the virtualization change, VoIP project, our refresh cycle change, and getting rid of unneeded contracts and software. (From Left): Warren Township’s Creative Thought Gallery; Warren Township’s SI-COM Lab; Warren Township’s Collaborative Learning Studio. The idea was to eventually take the Mediaplex concept into all of our schools, but this was a big challenge. We have a million square feet just in the high school. We have three-and-a-half million square feet between all of our buildings. So when we applied for and won a national Race to the Top grant, we then had access to 28 and a half million dollars to help us make that dream a reality. Using this funding, we took the Mediaplex design and are putting it in our middle schools to get the students acclimated to 21st-century skills before they get to the high school. We’re also putting it into the Walker Career Center and in the classrooms at the high school. TL: How did teachers respond to the change? JA: For the most part, the teachers accepted it. You always have those outliers who wonder why they should change when they are meeting all of their benchmarks. I would ask, “Is meeting that number really a way to prepare students for secondary education, the military, or a job?” Meeting that number doesn’t necessarily mean they’re ready to move forward. This new learning space allows students to learn to communicate and write appropriately—all of which are soft skills that they will need. I think we need a truly personalized learning approach to get students where they need to be. And our high school does have a 90% graduation rate. TL: Who did you invite to the decision-making process as you planned your new spaces? This digital newsroom sits in the entry way of MSD of Warren Township’s Mediaplex. JA: It started with just me asking the question: “What do these rooms need to look like?” I knew we needed a concept before approaching an architect. From there, I got approval from our superintendent, who has been very supportive of the initiative. Next, I created a student group and a teacher group and got their feedback. In the first Mediaplex design, we kept a lot of the same spaces that I designed originally, but the students asked to make a few changes. They wanted two collaborative areas instead of one, they thought that two SI-COM labs were enough, and they also asked if we could come up with another space. They really pushed us. That feedback led us to design the Creative Thought Gallery—or what the contractor affectionately called the “crazy room” since it was difficult to build. But we made those adjustments based on this student feedback. The teachers wondered how they would actually teach in this new space, so we went through all the different pieces of instructing in that type of environment. We had the gamut of teachers—from the very tech savvy who would adopt this immediately to the teachers who didn’t use much tech. We wanted this full range of perspectives, and it’s paid off. The other big proponent of this initiative is David Holt, our CFO. He’s really been my partner in all this from a financing perspective. He and my superintendent have a lot of faith in me, but they’re also a big reason why the Mediaplex concept worked. TL: What would be your advice to a school ready to take this on? First, find your champions and look at what exists out there. Universities especially are doing some innovative learning spaces. Examples include Ball State University in Indiana, which has a small space of about 4,000 square feet. Another good example, from a higher education perspective, is the University of Southern California. The thing to keep in mind, though, is design in higher ed spaces is for very different purposes than what we need to do in K-12 classrooms. We still have 30 kids in a classroom; they don’t. It’s a challenge to accommodate that number of kids. Higher ed is also designing their spaces for students during their free time. We’re designing spaces to be a retreat from the normal classroom and to offer a space to learn 21st-century skills. When I started this project two years ago, I had trouble finding examples, so that’s when I just started to design it on my own. I thought about computer labs, for example. Computer labs aren’t that different than typing labs were 30 years ago. We didn’t change the model; we just replaced typewriters with computers and lined them all up. Then we put six kids looking at six different computers researching six different things, even though they’re supposed to be collaborating on that project. That didn’t make sense. That’s why we created the collaborative learning studios. Now students sit around the table, just like we do in the corporate world, and collaborate. Then, of course, you have to pay for it. The best starting point is your CFO. Collaborate with your CFO and try to find someone who is strong in operations management, maybe even with a business background like I have. There are ways to maneuver the project so that it is more affordable. Don’t go too far and recognize your limitations. We redeveloped 17,000 square feet, which is the original square footage of our library. By staying within the existing space and reusing some of the existing walls, we were able to get the most out of our money by putting it into the technology instead of construction. At the end of the day, we’re getting an engagement improvement out of the re-design, but it also has a cool factor. We don’t call it a lab anymore. It’s a creative thought gallery where kids can go and collaborate on eight 27-inch iMacs for research and then turn around and draw their thoughts on a wall. Sure, part of this environment is low tech, but it’s very effective just because of a cool-looking environment and some dry erase paint. It really is an innovative space.